‘My faith has never been stronger as the storm clouds have never been darker,’ he says. HOLLYWOOD, CA (ANS – Feb. 14, 2016) – For the millions of fans of The Simpsons hit TV show, Lance Wilder has a dream job, for he’s been a top designer since 1990 on the American animated sitcom created by Matt Groening for the Fox Broadcasting Company. 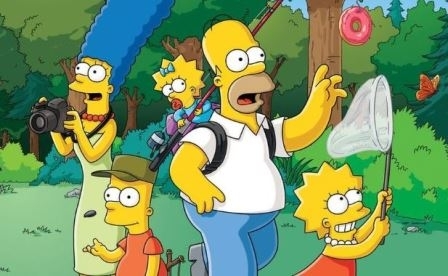 The series is a satirical depiction of a middle-class American lifestyle epitomized by the Simpson family, which consists of Homer, Marge, Bart, Lisa, and Maggie. The show is set in the fictional town of Springfield and parodies American culture, society, television, and many aspects of the human condition. I recently caught up with Wilder and his 12-year-old daughter, Miranda – the youngest of his four children — c, to learn how life has been treating him. In a moving interview, Lance revealed that he has been going through some serious problems, but still God has been seeing him through them. I began by asking Lance, who attended the Rhode Island School of Design and graduated in 1990 – the show premiered back in December of 1989 — how he had been able to keep his Christian faith, through the recent painful problems he has been through. Wearing his well-known bandana and ponytail, Lance stated, “He created me and my family and has seen everything from the beginning. He promises that if we ask for forgiveness, repent and turn to Him, He will forgive us, carry us, and transform us step-by-step through all things for His kingdom and glory. “I am reminded of His amazing presence, help, generosity, patience, love and amazing grace through the trials in the past. He has been so patient with me through my struggles and weaknesses, and has been so faithful to never give up on me or my family through it all. His blessings so far outweigh the trials He allows. He has been with us through it all. Lance went on to say, “God wants us to surrender it all to Him and turn to Him, relying on Him to help us, forgive us and help us back onto His path and plans. He also wants us to allow Him to transform us into the people He created us to be. He is the sovereign Lord, and we are not. Even when we mean well, if we are trying to juggle family, work, money and figure things out ourselves…it’s not a good thing. It can so often lead to burn out, and a loss of peace and joy when we are always trying.to control everything. “My hope is to encourage everyone to surrender it all, the blessings, the painful trials and everything in between, and know that the Lord’s way is always the best. It’s all about putting my focus and hope on Jesus, in every moment and in every situation, not just knowing about Jesus, but surrendering everything to Him and choosing to let Him be the Lord of every area of my life. Then, talking about his long time with The Simpsons, he said, “I’ve been doing this a long time and the truth is that’s it’s been a rollercoaster. There’s been up seasons and down seasons in life and it’s been difficult at times; but I believe everybody there knows where I stand as a Christian. It’s a process; and I am so thankful that the Lord never gave up on me. “He is faithful in the good times and the tough times, but I stand firm on what I believe and I also respect the people I work with, some of whom are Christians, but I also work with a lot of non-Christians. I then discovered that Miranda is kind of following the footsteps of Wilder. She told me, “I love drawing, and I also love The Simpsons. With that Lance and Miranda were off to join the star-studded crowd of stars like Dolly Parton, Jane Seymour and Kevin Sorbo, inside the Gala, and enjoyed some respite from the storms of life they have been going through. Note: If you would like to send a message of encouragement to Lance Wilder, please send it to me at danjuma1@aol.com, and I’ll be glad to forward it to him. Photo captions: 1) Lance Wilder. 2) The Simpsons relaxing at home. 3) Lance Wilder at his artist desk at The Simpsons (Photo: Dan Wooding). 4) Dan Wooding with Dolly Parton at the recent Movieguide® Gala in Hollywood.